This image is a simulation of the X-ray binary system Swift J1357.2-0933, a black hole and star system, in which the effect of a strange, vertical mystery structure are at their maximum. Astronomers studying an unusual black hole system have spotted a never-before-seen structure in the disk of matter encircling the system. Swift J1357.2, an X-ray binary system that regularly emits outbursts of high energy, consists of a black hole slowly consuming its companion star. Matter from the doomed star falls into the accretion disk, which surrounds the black hole, feeding it dust and gas. While observing the system, a team of scientists noticed an unusual vertical feature traveling through the material. This image is a simulation of the X-ray binary system Swift J1357.2-0933, a black hole and star system, in which the effect of a strange, vertical mystery structure are at their minimum. The black hole contained in Swift J1357.2 is one of the millions of stellar black holes that dot the Milky Way galaxy. About three times as massive as the sun, the behemoth likely formed when a single star collapsed inward on itself. The resulting, city-sized body packed a great deal of mass into a tiny package, creating a strong gravitational pull on nearby dust and gas. Located in the Virgo constellation, approximately 4,900 light-years from Earth, Swift J1357.2 also contains a small companion star, which has only a quarter the mass of the sun. This companion star orbits the pair's center of mass every 2.8 hours, one of the shortest known orbital periods for such systems. The black hole pulls material from the companion star into its accretion disk, occasionally emitting the X-ray bursts that enabled scientists to find this otherwise hard-to-spot system, researchers said. Corral-Santana and his team took hundreds of optical images of the system using the Isaac Newton and the William Herschel Telescopes, both of which are in the Canary Islands. 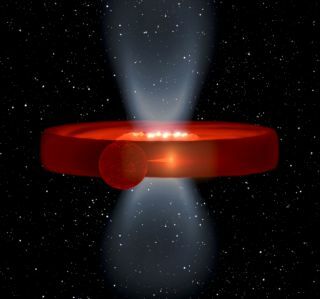 Studying the light produced by the accretion disk, the researchers noticed a periodic dimming in the system, sometimes occurring over the course of only a few seconds. "Since the orbital period of the system is 2.8 hours, those dips cannot be produced by eclipses of the companion star. They are much faster," Corral-Santana said. "Therefore, they must be produced by a hidden structure placed very close to the black hole, in the inner accretion disk." The new find can only been seen in the outer, optical portion of the accretion disk, not on the inside, where X-ray bursts originate. The X-ray emission, which shows no periodic variation, unlike its optical counterpart, indicated a vertical structure was hiding the black hole, Corral-Santana said. Rather than appearing at a set, predictable time, the structure shows up over a steadily increasing period, indicating a wave-like movement through the accretion disk. "It is a wave produced in the accretion disk, moving outward," Corral-Santana said, "like the wave produced when a stone is dropped in calm water." The wave-like feature also provides information about the orientation of the black hole. Objects in space face Earth at a variety of angles, or inclinations. They can be seen edge-on, face-on or somewhere in between. Swift J1357.2 is the only one of 50 suspected similar black-hole systems found with an edge-on accretion disk — what scientists call a high inclination. However, astronomers think approximately 20 percent of these systems should provide such a perspective. In order to see the wave-like structure in the accretion disk, scientists must have such an edge-on view of the disk, or one close to it. A view from a lower inclination, closer to face-on, would not reveal the sudden rises and falls in the total light coming from the system. "Swift J1357.2 is the prototype of the hitherto missing population of high-inclination black holes in transient X-ray binaries," Corral-Santana said. Because Swift J1357.2 is the first such system to allow such an edge-on view, the presence of the vertical structure takes on an added significance. No signs of such structures appear in other similar systems, but that could result simply from their unfortunate angles. Such structures could in fact exist in other, previously discovered transient X-ray binary systems, hidden only by their observational angles. The findings were published online today (Feb 28) in the journal Science.